When you want the utility of a truck, the park-ability of a car and would like to attempt to remain financially responsible, you may find yourself looking at used compact pickup trucks. Anyone who has ever considered looking into the market of practical-size used trucks knows that there is one model that tops the list every time: the Toyota Tacoma. While there are many other trucks that can fit the bill, few can compete with the Tacoma’s second-hand demand. These darn things command such high used values because they represent the size of truck many of us can justify. The Tacoma also has the perceived mechanical reliability that has been carried on from the generations of Toyotas preceding it. While the reliability claim may hold some water, it shouldn’t simply be taken for granted. Save for a complete up-to-date service history and a caring previous owner, purchasing one of these mini-movers may come with a larger maintenance overhead than you realize. A few months ago I found myself out of a truck and back in the market for something a little more modern. My love for Toyota 4X4s will never cease, so an early 2000s Tacoma fit the bill nicely. Like anyone, I wanted to get the best deal possible on one. 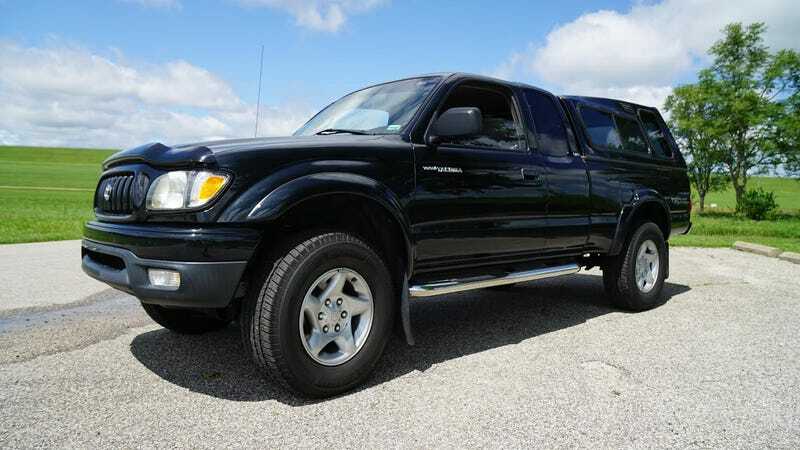 Eventually, one came along that seemed almost perfect: A 2003 Tacoma 4x4 with a V6 engine. I got it for a mere $3,000, which is admittedly way below the normal market price for these. Unfortunately, it was fitted with an automatic transmission. When you’re faced with an unbelievably low asking price, some exceptions must be made. The truck had a relatively low 115,000 miles. At the seller’s house before taking it home. There was so much crap stored underneath that bed cap. There were zero maintenance records and it had a spotty ownership history. On the upside, the truck’s frame had been replaced thanks to the infamous Toyota frame recall campaign. You heard that right: frame recall. Tacomas have a history of catastrophically-rusted frames. The rust can develop around the rear spring perches of the frame and over time this rust can progress into full-on metal perforation. The result is a weakened frame, and in some cases, it leads to the frame breaking in half. Oops. For a period of time, Toyota would replace rusty frames on affected trucks at no cost to the owner under the recall. They would completely disassemble the vehicle and slide in a brand new, “superior” frame. However, there is an age-cutoff before the truck is deemed “too old” to qualify for the recall. I think it’s safe to say this is not something you want to pay for out-of-pocket. You might add that little detail to your used Tacoma buyer’s guide. That bed cap belongs in the ’80s. Overall, this particular truck looked decent and ran well enough, but I could tell it hadn’t exactly lived a cared-for life. It was dirty, had a flat battery, the Check Engine Light was on, and it was packed full of the previous owner’s belongings like a mobile storage unit. No matter - I figured with the money I was saving on the initial purchase, I could risk the mechanical unknown. Here’s exactly what it cost me to make my used Tacoma not just a nicer vehicle, but a truck that could continue to live up to its legacy of reliability. The truck ran and drove fine, but there was no maintenance history. I didn’t feel comfortable driving the truck any further than directly home after the purchase. The Check Engine light was glaring in my peripheral view and the thought of a timing belt snapping left my stomach churning. It was time to get down and dirty under the hood. Many of these trucks came equipped with the V6 (5VZ-FE) engine, which means there is a timing belt lurking within. The belt is supposed to be changed out at around 90,000 miles. This truck was presumably on its original timing belt with 115,000 miles going on 14 years. That’s what we call living on borrowed time. Yikes! Thankfully, these engines are “non-interference” which means if the belt were to break, no engine damage would occur. However, you would still be left stranded at the roadside and your ride home would be a tow truck. It’s best not to let this bit of maintenance slide. As I began to dig into the front of the engine, my first glimpse of the timing belt was not good. The belt didn’t have much more time left judging by the cracks that were forming throughout. This is what the front side of the engine looks like after 115,000 miles. No one has been in here since the truck was built. The water pump had developed a slow leak and was leaving some clumpy deposits behind. This nasty stuff was also contaminating the timing belt tensioner directly underneath the water pump. If left unattended, the engine could have easily overheated or lost proper tension on the timing belt, neither being a good thing. Before going any deeper into the engine, I figured this was a great time to get things cleaned up. After a thorough engine degreasing, the front of the engine looked much more presentable. From there, I pulled out the old camshaft and crankshaft oil seals. While there was no sign of leakage from the seals, it would be foolish to not replace them while I was in there. With the engine torn down to the final disassembly point, it was time to get all of the new parts together. I always recommend buying OEM parts on a job like this. Using OEM-quality parts will give you the peace of mind that when the engine is buttoned back up, you won’t have any more trouble until you’re back in there 90,000 miles down the road. The first step of the reassembly was to press in the new oil seals. This was followed by the installation of a new water pump, idler pulley, and belt tensioner. The new timing belt could then be routed, paying close attention that all alignment markers on the belt matched up with the markers on the camshaft and crankshaft sprockets. The fan bracket and all of the plastic covers could now be reinstalled. I shot some new paint on various metal components as they were looking old and rusty. The engine bay now looks a little bit better thanks to it. With the timing belt service decal applied, the engine is ready to go for many miles to come. Alright, so this is hardly a difficult or expensive repair. The battery in this truck was barely hanging on, not to mention it had managed to create a huge mess in the engine bay. When battery acid is left to its own devices, serious corrosion can occur with the metal battery mount inside of the engine bay. A simple clean up while the battery was removed would extend the mount’s life indefinitely. Finally, with a new battery fitted, the truck would be sure-start with every turn of the ignition key. The fuel filter had the appearance of a part that had been on the truck for 115,000 miles. The filter is completely unshielded from the elements, and it looked terrible. I’m sure the internal filtering capabilities weren’t doing so hot either. The last thing I wanted to do was round off the fittings that screw into the filter. With the presence of rust, this was a scenario that kept playing on repeat in my head. I soaked the fittings with penetrating oil over the course of a few days before attempting to take on this job. Luckily for me, I was able to crack the fuel lines open without incurring any damage. With the new filter installed, I could now be assured the engine’s fuel injection system would receive the correct flow of fuel for a long time to come. I had no idea when the spark plugs were last changed. As you can see in the picture below, the old plugs weren’t in terrible shape, but at least now I know the plugs are in perfect operating condition. Swapping the old plugs for new was a quick and inexpensive maintenance item that should be on everyone’s replacement list when encountering a new-to-you vehicle. The good ol’ Check Engine Light was illuminated on the dashboard. After a quick code read with the OBDII scanner, I found out that the culprit was a faulty oxygen sensor. At nearly $90, this little sensor wasn’t cheap, but at least there was only one to replace. Thankfully it was in a somewhat accessible spot as well. Plugging in the connector, clearing the engine code, and then starting up the truck saw the Check Engine Light gone for good. Sometimes, Toyota makes consumable parts extremely easy to replace. For example, the air filter. As you can see by the old filter, it had been a while since this maintenance procedure was performed. There’s no reason to not replace the filter often. It’s only $10 and only 20 seconds to swap out the old with the new. Ride quality and handling is heavily dependent on a vehicle’s suspension and tires. This well-used Tacoma had been stretched to its limits when it came to these components. Nearly all of it was ripe for replacement. This truck came from the factory with some trick-looking Bilstein shock absorbers as part of the TRD Off Road trim package. It became apparent that these poor shocks were long past their prime. Any small bump in the road would see the front of the truck bobbing around like a nautical vessel caught in rough waters. A quick look through the wheel well told me everything I needed to know. The front shocks weren’t just old, but were leaking heavily. There was practically no dampening left. Since the front suspension utilizes a coil spring setup, the springs must be compressed in order to completely remove the shocks. I thought it was a good idea to replace the old shocks with new Bilstein units. Not only would they look sharp when installed, but they also would provide superior dampening which translates into a much more comfortable ride. With the spring compressed, the new shock slips through the middle of the spring and then the top hat can be secured down with a new nut. From there, the compression on the spring can be released and then the new shocks are ready to go back on the truck. The rear shocks weren’t in terrible condition, but I felt it was wise to replace them in coordination with the fronts. This would ensure the front and rear suspension would be similarly tuned to give an even feel throughout the vehicle when encountering road imperfections. The tires were long past their use-by date. The rubber was sun baked and there were cracks visible in the treads. They created an audible growl from inside of the cab when rolling and when I took low speed turns, they would squeal terribly. New tires are never “cheap” for trucks, especially when you swing for some name brand donuts. I elected to go with Michelin tires because I’ve only had good experiences with them. After having them installed, they quite simply made the truck feel “new.” There is absolutely no road noise and they grip the asphalt like nothing else. This probably goes without saying, but brakes are important. Bad brakes can cause some serious trust issues with your vehicle. When the brake pedal pulsates and the steering wheel wants to rip out of your hands at the slightest slow down, it’s time to give the stoppers some attention. The front brakes looked fine from the outside, but the feel from inside the truck when slowing to a stop told a much different story. All signs pointed to warped front brake rotors. I decided to fit new brake rotors and brake pads to cure the brake ailments. This is a fairly inexpensive operation which will return the truck’s brakes to like-new performance. When you find yourself doing truck things like hauling around extra weight, you want your brakes to be in optimal condition. The drivetrain on 4x4 vehicles is complex and has many components that are often neglected. About the only time the parts in the system get attention is when they fail completely. However, it doesn’t have to be that way if they are serviced regularly. I had no idea when the last time the automatic transmission fluid in the truck was replaced. By the dark red color on the dipstick, my estimate would be a “very long time ago.” I elected to do a complete transmission fluid exchange. The first step in the process was to drain all of the fluid out of the transmission oil pan. Simply removing the drain plug at the bottom of the pan allowed a few quarts of the old fluid to drain out. Inside of the transmission oil pan are a few magnets that are there to catch any foreign debris caused by the normal wear and tear on the transmission. Dropping the pan can be a messy proposition, but doing it will help you get a better idea of the transmission’s health. Once the pan is dropped, you can inspect the magnets and take a look at the transmission filter. In this truck, the “filter” isn’t so much a filter as it is a metal strainer screen. It is there to catch large debris, if there were to ever be any. The magnets and the strainer in this transmission didn’t look too bad at all. I wanted to do a full transmission fluid exchange so I ended up getting 14 quarts of new Toyota-brand transmission fluid. I also picked up a new transmission filter and a new transmission pan gasket to complete the job. With the new filter installed, a new gasket applied to the transmission pan, and the cleaned up magnets placed in their respective homes, it was time to bolt the pan back up to the transmission. The next step was to refill the transmission with the equivalent quantity of fluid that I had removed. I then removed the transmission cooler hose from the radiator and directed it to drain into an old milk jug. Turning the engine on, I let two quarts of transmission fluid pour out, then shut the engine off. I then added two quarts of fresh fluid to the transmission. I repeated this two -out-two-in process until cherry-red transmission fluid was coming out of the transmission cooler hose. With the hose reconnected to the radiator, I turned on the engine and checked the fluid level on the dipstick. I added in the remaining amount of fluid to bring the dipstick level to the “Full” mark. Job done! Outside of the transmission, there are three separate gearboxes on this truck: the transfer case, the front differential, and the rear differential. Armed with many quarts of fresh gear oil and new drain and fill plug washers, I exchanged the oil in each one of these drive line components. The final drivetrain components to receive some preventative care are the universal joints and driveshaft slip joints. There are a number of grease fittings throughout to provide proper lubrication to each one of these components. A few pumps with the grease gun on each fitting saw the joints well lubricated and flexible once again. The repairs I ended up having to perform, and the money I had to spend doing them, more than likely would have been needed no matter the example of Tacoma I had purchased. Cosmetics may have been better if I had paid more initially, but for the most part, these used trucks have high miles and have the preventative maintenance forgone. This is just the reality of a vehicle that runs well even without being given much of any mechanical attention. Second-hand buyers may believe they are getting a truck that is invincible, but this stereotype shouldn’t be taken for granted. The Toyota Tacoma is still a machine that can get worn and will need some attention every once in a while. If you want to make sure your new-to-you Toyota Tacoma will keep on truckin’ for many years to come, be sure to budget for the mechanical love it not just needs, but has earned. One day that bed cap will go away.